WW1 deserter honoured by his community :: Great War Dundee - This is the story of the 30,490 men that left Dundee to fight in the First World War and of the people left at home. The tragic story of a Black Watch soldier executed for desertion during the First World War is being told anew for today’s youngsters, thanks to a partnership between Abertay University and the Nine Incorporated Trades of Dundee. Private Peter Black, aged just 21, was shot by firing squad at 5:47am on 18 September 1916. His name might have been forgotten forever were it not for a public outcry in his hometown of Newport-on-Tay. After the war, plans were drawn up for the town’s official war memorial to commemorate the 84 local men killed in the conflict. Some bereaved parents and the local war memorial committee demanded the architect Robert Lorimar (who also designed the Scottish National War Memorial located in Edinburgh Castle) exclude Peter’s name on the grounds that it was ‘unsuitable’ for a Roll of Honour. However, ex-servicemen including friends of Peter’s who had gone to war with him protested angrily, even threatening to blast the memorial into the River Tay with gelignite if Peter’s name wasn’t on it. They believed that he shouldn’t have been in the frontline at all due to his fragile mental state at the time, and that his service in major battles earlier in the war gave him as much right as anyone to be included. At a stormy public meeting, the Newport community voted overwhelmingly that Peter’s name should appear on the monument – a highly unusual view at a time when most people regarded desertion in wartime as a disgraceful crime. 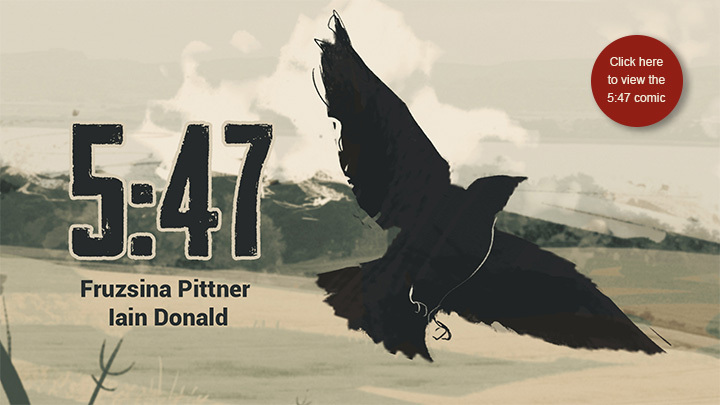 Cover image to 5:47 a digital comic by Fruzsiner Pittner and Iain Donald of the University of Abertay Dundee. Click on the image to visit the Shot at Dawn page. Now, the story is being told afresh for today’s generation in a digital comic entitled ‘5:47’ – a reference to the time of Peter’s execution at dawn. The comic will be made available for free download from the Great War Dundee website on Sunday 18 September, exactly 100 years after Peter’s death. An Innovation Internship funded by the Nine Incorporated Trades enabled computer arts student Fruzsina Pittner to design the comic. Dr Iain Donald, Abertay University. Dr Iain Donald of Abertay University, who supervised the project, commented: “By combining her design and software talents, Fruzsina has created a truly evocative digital comic that reflects upon the tragedy and misery of war and what it can do to fragile young minds. “’5:47’ also prompts us to think about the meaning of community both in 1916 and in 2016, and to raise awareness of PTSD – which Peter would almost certainly have been diagnosed with had he served in today’s forces. As well as Abertay University and the Nine Incorporated Trades, many other organisations have contributed to the project, including the University of Dundee, Leisure & Culture Dundee, DC Thomson, the Black Watch Museum, the Imperial War Museum and the Western Front Association.